Here’s your homework! 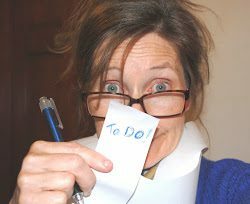 I know you checklisters will LOVE getting something to DO to follow-up on this Bible Study Blog! ____Read the REST of the story in Ephesians 5:22-33. How much should our husbands love us? ____According to Ephesians 5:22-33 — What equals LOVE for a husband? It starts with “R” ! ____Where should we place our baggage? Read Matthew 11:28-30 for a precious hint. ____Who just might be the “least of these” mentioned in Jesus words in Matthew 25:40? ____Who is your TRUE and GENUINE “Soul Filler”? Thanks for hanging in and “checking out” these questions and Bible verses! ‹ PreviousHow to Make Jesus Smile…And Save Your Marriage!